Artist: Felicia Fragua (Jemez Pueblo). Dimensions: (Joseph) 5 1/4" tall X 2 3/4" Wide - Other pieces are proportionate. Description: 4 piece Nativity Set with Chief Joseph, Mary, Baby Jesus and a Donkey!! C & D Gifts Native American Art, LLC is a small husband & wife owned business started in 2003. We have lived in New Mexico for over 20 years and have developed a true love for Native American Arts & Culture. Living in New Mexico gives us direct access to many different Pueblos and other sources for the artwork that we offer. Not only do we sell, we also collect these wonderful treasures! Sometimes it's hard to list an item, because we want it too! We have developed relationships with many artists and vendors and strive to make available quality pieces for reasonable prices. We try to offer a variety of products in all price ranges. In fact, we believe the more communication the better. An informed customer is a satisfied customer. Old fashioned values are what we believe in. A handshake, our word, and the Golden Rule, "Treat others as you wish to be treated" are all beliefs that we live by and do business by. We don't want to sell to you once and never hear from you again. We want to develop long term relationships and be your source for Native American Arts. Please bookmark this page and come back and visit us often. We are always listing new items. Don't forget to tell your friends about us! 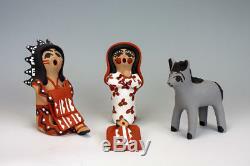 The item "Jemez Pueblo American Indian Pottery 4 Piece Nativity Set Felicia Fragua" is in sale since Tuesday, May 30, 2017. This item is in the category "Collectibles\Cultures & Ethnicities\Native American\ US\1935-Now\Pottery". The seller is "canddgifts2" and is located in Rio Rancho, New Mexico. This item can be shipped to United States, Canada, United Kingdom, Denmark, Romania, Slovakia, Bulgaria, Czech republic, Finland, Hungary, Latvia, Lithuania, Malta, Estonia, Australia, Greece, Portugal, Cyprus, Slovenia, Japan, China, Sweden, South Korea, Indonesia, Taiwan, South africa, Thailand, Belgium, France, Hong Kong, Ireland, Netherlands, Poland, Spain, Italy, Germany, Austria, Bahamas, Israel, Mexico, New Zealand, Philippines, Singapore, Norway, Saudi arabia, Ukraine, United arab emirates, Qatar, Kuwait, Bahrain, Croatia, Malaysia, Brazil, Chile, Colombia, Costa rica, Panama, Trinidad and tobago, Guatemala, Honduras, Jamaica, Antigua and barbuda, Aruba, Belize, Dominica, Grenada, Saint kitts and nevis, Saint lucia, Montserrat, Turks and caicos islands, Barbados, Bangladesh, Bermuda, Brunei darussalam, Bolivia, Ecuador, Egypt, French guiana, Guernsey, Gibraltar, Guadeloupe, Iceland, Jersey, Jordan, Cambodia, Cayman islands, Liechtenstein, Sri lanka, Luxembourg, Monaco, Macao, Martinique, Maldives, Nicaragua, Oman, Peru, Pakistan, Paraguay, Reunion, Viet nam, Uruguay.